Having now got the problem of having to tell people that I cannot supply this year now, and having a month to go before things start to get busy pressing, I have now finally had a chance to do something about this ever growing thing called the 146 Cider Company. Two new tanks have been purchased for this years Hampshire Heritage and Western cider. These will take 1500 litres; 50% more of each than last year. Also, the IBC's have been cleaned and will be repositioned so that I can press 1000 litres of Eastern plus one new cider(?!) or a further 1000 litres of Western. On top of all this I am in the process of acquiring a new piece of kit that I have been coveting for some time, and will improve output capacity without compromising quality. 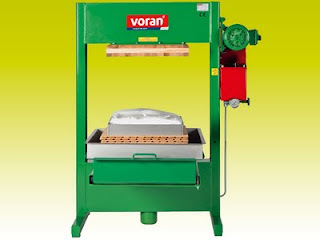 A Voran press. This piece of wizardry will not be installed in time for the start of the season (I think) but the Goodnature is big enough to take care of the early apples. As it will shorten the pressing time from 1h 30m down to about 30m for each cheese of pomace, I think it will mean I could easily meet the limit of 7000 litres - not that this is what I intend to do this year.